Anonymous, 30 Oct 2012So Nokia dumped their brain child Symbian and Meego for this?! What is this world coming to? D... moreMeeGo itself was a mistake. And Symbian was outdated. Was nothing left to keep anyway then. I didnt like Symbian even when it was the "only" alternative, only with Maemo5 did i finally feel that a cellphone could actually be used to do serious complex tasks. Even Symbian lovers cannot deny that, Maemo5 owned iOS and Symbian so hard that the echo of it hasnt died out yet. Anonymous, 30 Oct 2012Probably gonna get a wp8 phone as my n900 is crumbling to pieces now. Quite like the look of i... moreFrom N900 to WP? Yu will regret so much. From the unlimited possibilities of Maemo5 Linux even Android feels like a restricted OS with poor multitasking, but much less so than WP. I would still be using N900 if it had the performance we need today. For the OS itself theres still no competition, but Android is by far the closest. I am not so sure that you read the whole review if you are seriously considering to downgrade all the way down to WP. iOS and WP can never satisfy truly advanced users, and N900 users are by far the most advanced, right?? Even the MeGoo on N9 could never replace Maemo5, i had an N9 but it also felt like a big downgrade. Probably gonna get a wp8 phone as my n900 is crumbling to pieces now. Quite like the look of it. Hopefully there will be one with a sd card slot soon. totally fail & its a no-no device! --> Can we now add attachments to emails (WP7 only allowed images/documents using the office app). Is the functionality now available in the Email itself? --> Can we download and store/forward a file that is not supported on the phone(eg: .exe etc) ? --> Is there an orientation lock feature in WP8? Anonymous, 30 Oct 2012it doesnt have launcher support, swype (or any third party keyboard for the matter)grow up kid ... not every OS shud be like android ... if it is so then what is the need to have another OS or platform. Umm no it doesn't. It's been around for ages now and it's not really life-changing. Yet, every phone I owned with a colour screen had this. Then there's bluetooth file transfer. How can they NOT have had this before?! It's not 'good' of them to integrate this. It's just what was expected since the beginning of Windows Phone. So Nokia dumped their brain child Symbian and Meego for this?! What is this world coming to? Dumb smartphones? - There is file transfer over Bluetooth. - There is support for custom ringtones, you just need to put them in the Ringtones folder in the phone's memory or the SD card. - There are no equalizers by default, but companies are allowed to add such (i.e. Nokia and HTC, but not in the Ativ S). We already updated the review with those things and appropriate screenshots. Thanks to everyone, who pointed those things out! All I want to know is whether it supports downloading files from the browser. Seriously, what on EARTH is beautiful about this UI?! it's THE most boring one (right after iOS!) that could ever be thought of or put on any device (let alone a Desktop PC!). Ugly, Boring and Primitive UI made up of SQUARES! Are we back in the dark ages or something? Anonymous, 30 Oct 2012fandroids ain't like fanboys,who are blinded by their OS.... we love android coz it offers ... more"fandroids ain't like fanboys,who are blinded by their OS...."
-Is there a more oxymoron statement here in gsmarena than this? What about multi-tasking? 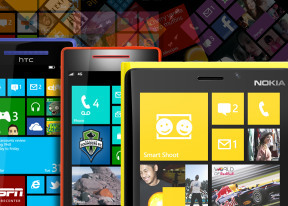 Is it better than on WP7 or the same? Same ugly, messy UI! The homescreen is hard to look at!